This video is part of the appearance, “Cisco Enterprise Switching Presents at Tech Field Day Extra at Cisco Live Europe 2019“. 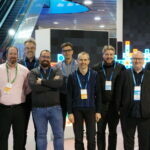 It was recorded as part of Tech Field Day Extra at Cisco Live Europe 2019 at 14:30 - 15:30 on January 30, 2019. This session will explore how Cisco’s latest advancements in powerful, programmable ASICs and silicon enable and support some of the latest innovations in Enterprise networking – including SD-Access, ETA, mGig, and next-gen wireless functionality.